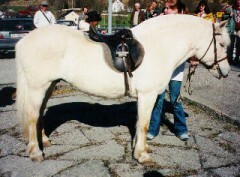 The Fjordhorse has several different sorts of dun colour. This is the same kind of colour as the wild horse of Central Asia, the Przewalski, and the Tarpan, the European wild horse. This kind of colour is also called wild colour. The basic wild colours are brown dun, red (chestnut) dun and grey. In addition, uls dun and yellow dun are genuine colours of the breed. At the annual general meeting of Norges Fjordhestlag in 1980, it was agreed upon and decided that these five colours shall be acknowledged as the genuine and typical colours of the Fjordhorse. This decision is also supported by scientific facts. In some countries, there is confusion as to what genuine and accepted colours of the Fjordhorse are, and what the correct terms should be. In the breed’s motherland, Norway, there has through the years been established fixed names of the different colours. These names have been official since 1922. It would undoubtedly be an advantage if these Norwegian terms could be used in all countries where there are Fjordhorses, either directly or by adjusting the different countries own terms to the Norwegian terms. The brown dun (“brunblakk” in Norwegian) is the most common colour. It can be found in lighter or darker shades. The colour of the body is pale yellow-brownish, and can vary from cream yellow to nearly brown. The “midtstol” (the darker stripe of hair in the middle of the mane), dorsal stripe and “halefjær” (darker hair in the middle of the tail) are black, or dark brown. The light coloured horses have white forelocks and white hairs on the mane’s outside. On darker individuals, these hairs are also darker. The red (chestnut) dun’s (“rødblakk”) body-colour is pale red-yellowish, and can also be seen in lighter or darker shades. In some cases, it can be difficult to tell the difference between a brown or a red dun. On the red duns, the “midtstol”, dorsal stripe and “halefjær” are red or red-brownish, always darker than the colour of the body, but never black. Mane and tail are mostly very light or yellowish. On the lighter shades of red duns, the forelock, mane and tail can be completely white. When they are foaled, the red duns can have white hooves, but the hooves will darken as they grow older. The greys (“grå”) have a body-colour which can vary from light silver grey to dark slate grey. “Midtstol”, dorsal stripe and “halefjær” are darker than the main colour. Forelock and muzzle area are dark in contrast to the brown and red duns who mostly have a light forelock and muzzle area. On the darkest individuals, the mane and tail can be very dark. If one had used the same pattern in naming this colour as in the naming of the others, grey should be called black dun, but this term has never been used. Uls dun (“ulsblakk”) is a variety of the brown dun colour caused by a factor which reduces the production of pigment, so-called diluted colour. The colour of the body is almost white or yellowish-white. “Midtstol”, dorsal stripe and “halefjær” are black or grey. Mane and tail has a lighter shade than the body. 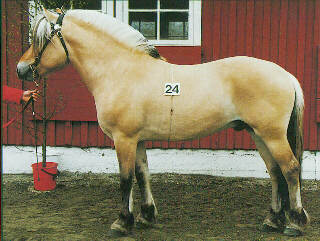 Yellow dun (“gulblakk”) is the rarest of the Fjordhorse colours. It is a variety of red dun caused by the same factor as mentioned under uls dun. The colour of the body is yellowish-white. “Midtstol”, dorsal stripe and “halefjær” are darker yellowish than the colour of the body. Forelock, mane and tail can be completely white, and on such individuals the dorsal stripe can be indistinct. From left to right: uls dun, brown dun, yellow dun, red dun, and grey. From left to right: grey, red dun, yellow dun, brown dun, and uls dun. An important part of the description and identification of a Fjordhorse, are the so-called primitive markings. These are the dark midsection in the forelock, mane (“midstol”) and tail (“halefjær” = tailfeathers), a dark dorsal stripe (“ål” = eel stripe) and dark horizontal stripes on the legs (zebrastripes), especially on the forelegs. Some individuals can also have one or more dark stripes across the withers (“grep” = grip). The last marking is very seldom seen. Some individuals can have small brown spots on their body, for instance on their thigh or cheek. The last one is called “Njåls-merke” (Mark of Njål) after the founder of the modern Fjordhorse, the stallion Njål 166 who had such spots on his cheeks. As mentioned in the preceding description of the colours, the colour of these markings differs according to the main body colour. On a red or yellow dun horse with a monochrome forelock, mane and tail, the dorsal stripe can be indistinct and the horse may not have the zebrastripes at all. On very light shades of brown dun, the zebrastripes can be very weak, or lacking. The zebrastripes have the same colour as the “midstol” and the other markings, but are often of a lighter shade. They are most prominent in the horse’s summer coat. Foals lack zebrastripes when they are foaled, but the stripes will appear by the first shedding of the foal-coat. The stripes are most prominent and in greatest numbers on the forelegs. In some cases, the zebrastripes are lacking on the greys and uls duns. On these, the legs can be of the same colour as the body, or they can be dark up to the knees and hocks. 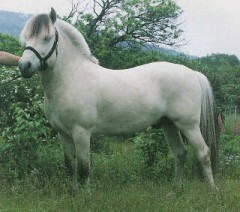 White, or flesh-coloured, markings are very seldom seen amongst Fjordhorses. By study of the Stud Book, and also according to other sources, one can establish as a fact that a white star on the forehead has existed as far back as we have written records. White and flesh-coloured markings are inherited in a recessive way. That means that the genes can be carried hidden, and that both parents must have these genes if the offspring shall get visible markings. The famous stallion Rosendalsborken I-8, foaled in 1863, had a sire of whom it is recorded that he had a white star. The same marking was borne by the stallion Håkon 60, foaled in 1877, of whom it is said that he was a beautiful horse and very typical for the breed. So one can not state that a white star on the forehead is not typical for the breed. Other white or flesh-coloured markings are undesirable. 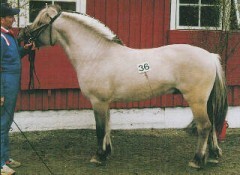 At the annual general meeting of Norges Fjordhestlag in 1982, it was agreed upon and decided that stallions or colts with other visible markings than a small white star, can not be licensed or awarded a rosette. 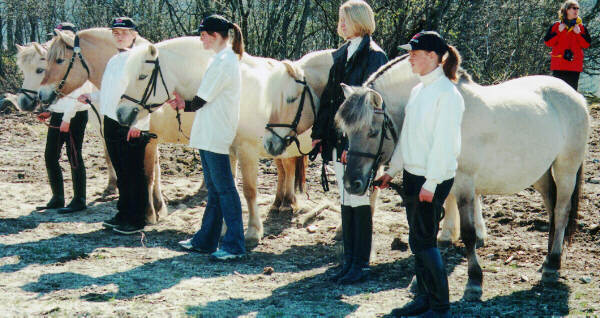 The different kinds of dun colours have varied in numbers within the population of Fjordhorses through the times. Among the earliest registered Fjordhorses in the Norwegian Stud Book, the uls dun was the dominant variety of colour. This colour was also called “borket”. Uls dun came in disrepute because at the time, no one knew how the different colours were inherited. So uls dun was bred to uls dun, and that resulted some times in white and walleyed foals. The brown dun colour later became increasingly popular, especially the lighter shades, and it is now the dominating colour. The extension of the colours can also be caused by the fact that the colour of the most popular and most used stallions, was brown dun. On the other hand, these stallions could also be more popular because of their colour. Changing opinions of what is thought to be fashionable has also been a strong factor. At the present, there is interest in preserving all the five dun colours. Regarding the stallions, there had undoubtedly been a “colour selection” prior to being prepared for a show. Stallion owners would perhaps not present a horse for evaluation if they felt he had the “wrong” colour. This occurred especially in earlier times, when for instance red dun was not so popular. The division of colours of registered mares gives a more reliable picture of the real division of colours in the whole population. Greetings!!! You have a WONDERFUL website! I am on the NFHR BOD. As the director of promotions, I have been asked to rewrite the Fjord page for Wickpedia. We are also looking to resubmit pictures. In my search for examples of the Fjord colors, I have yet to find such fine examples as you have on your page. Would you be willing to let us use your colors of the Fjord pictures on the Wickpedia page? If so, I would need the pictures emailed directly to me with a release for use. The pictures and release then go to Wickpedia along with the other photos and releases. You would, of course, receive photo credit. 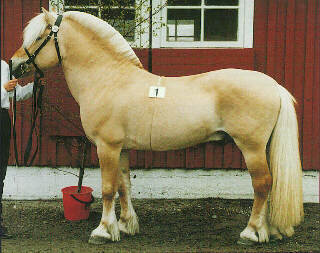 This type of collor is te cremello version of the fjord-horse and extreme rare in there spieces. Europe counts less 0,001% of the horses with this collor.